Diversity is the 6th Annual Workshop Exhibition of the JeOn Art Booth (JAB), showcasing a new body of work produced last year by the workshop member artists. 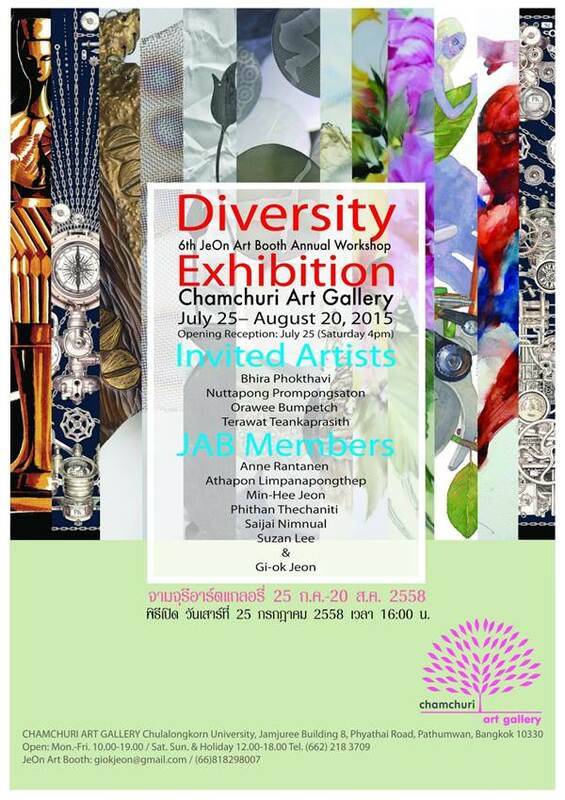 JAB is an art circle of traditional Oriental painting by general public who live and work in Thailand. Regardless of the member’s nationality, it has actively performed its art programs and regularly held its member shows since 2001. This "Diversity" exhibition features the works by six member artists, four invited Thai artists and the program director of JeOn Art Booth who is also the curator of this exhibition. Celebrating the third exchange exhibition with the professional local artists, "Diversity" aims to inspire the members for their creative desire and to seek for various methods of art creations, whiling having wider experience of art practice. As the title of this exhibition implies, the exhibition will highlight a variety of materials and techniques incorporated in their arts. It is our hope that this exhibition will provide an opportunity to explore how different ideas and working methods about ‘diversity’ are presented through art.